After hearing good things, stalking online reviews, and having a few close friends fall in love with the service, I finally buckled down and tried Stitch Fix for myself! I spent some time filling out the online style profile, and then updated my Pinterest page to better reflect stuff I would want to wear. 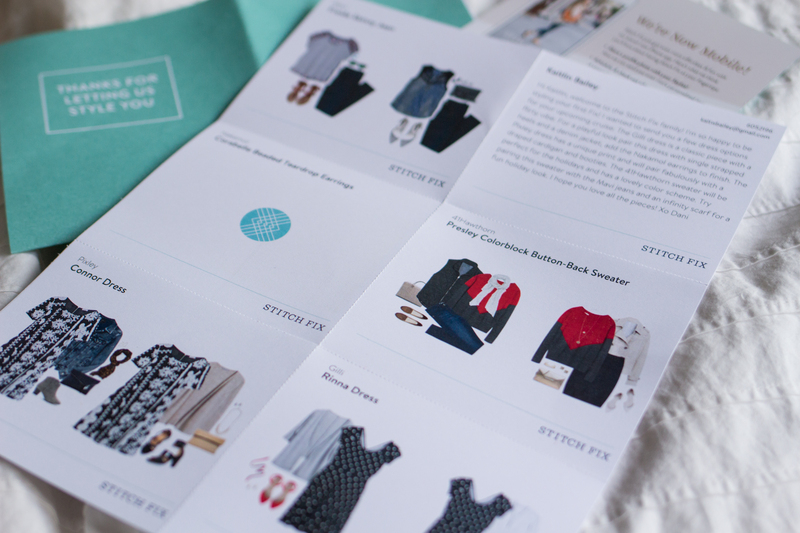 Stitch Fix is an online styling service that ships handpicked clothing and accessories right to your door. The styling fee is $20, which goes towards your purchase. You have a few days to try the items, which they send with style suggestions, decide what you want to keep, and then send back what you don’t want in the prepaid envelope. Simple and wonderful! For my first fix, I requested a dress that would be good for our upcoming family vacation, as well as a casual top that would be good for the holidays. My stylist sent me two dresses, a sweater, jeans, and earrings. The fit on everything was great (which was a pretty big worry), and the style wasn’t too far off from things I would normally go for. The Presley Colorblock Button Back Sweater by 41Hawthorne was cute, but not really my style or a color I like to wear. The back had a sweet button detail, but overall it just didn’t feel true to my style. Sent back. The Freida Skinny Jean by Mavi they sent were really comfortable, definitely a legging jean style. The fit was good, but I already have a pair of skinnies that I love, so I just didn’t need this pair. Sent back. The Rinna Dress by Gilli was really cute and had an adorable cutout detail in the back. Unfortunately, I was not a fan of the cap sleeves, and the polka dots felt a little too retro for my taste. Sent back. 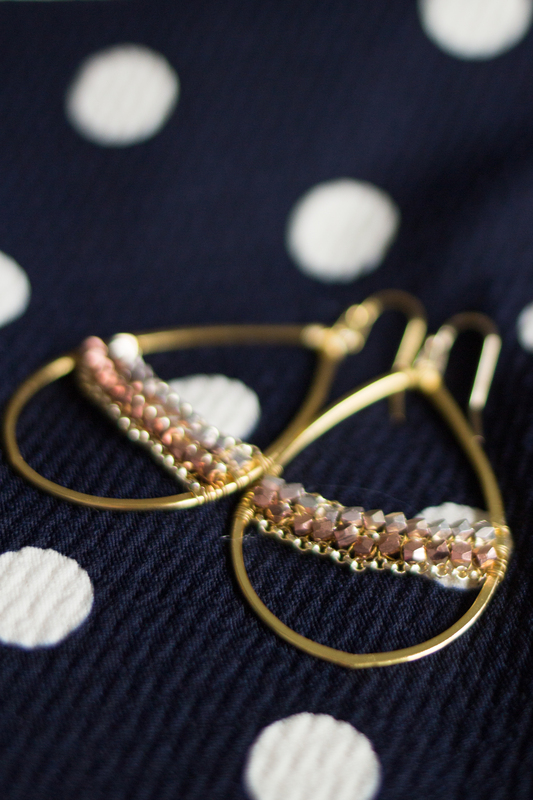 These Corabelle Beaded Teardrop Earrings by Nakamol were cute and seemed to be a great quality. With teaching in the lab I can’t wear much bold jewelry, so I couldn’t justify keeping these, since I liked them but didn’t love them. Sent back. Call me crazy, but I love the Connor Dress by Pixley. When I first pulled it out, I thought the print was a little much. But the more I looked and mixed it with different accessories, the more I realized how versatile it would be. It’s lined and has an exposed zipper detail in the back, and while it’s a little outside of my comfort zone, I like the overall feel of it and definitely look forward to mix and matching it! Kept it! I think that Stitch Fix will be a great way to challenge me to expand my style a little more, as well as add to the convenience factor of helping me expand parts of my wardrobe that I just don’t love giving attention to. Work clothes are just not my favorite thing to shop for, I’m more of an outerwear and shoes kind of gal, so I hope that Stitch Fix will help give a little love to the corners of my wardrobe that get neglected (I’m looking at you, the one pair of black dress pants that I wear at least twice a week). If you’re interested in trying Stitch Fix for yourself, you can use my referral link to sign up (I get Stitch Fix credit if you use my link and order a fix). When I first looked into signing up for the service, I stalked countless blogs looking at their detailed reviews, and just wanted to document my own experience with the service here! I LOVED the top two outfits on you! I know you didn’t care for them, but I thought you looked fantastic in them! Thank you!! I was so pleased with the fit of everything, even though they weren’t quite my style! 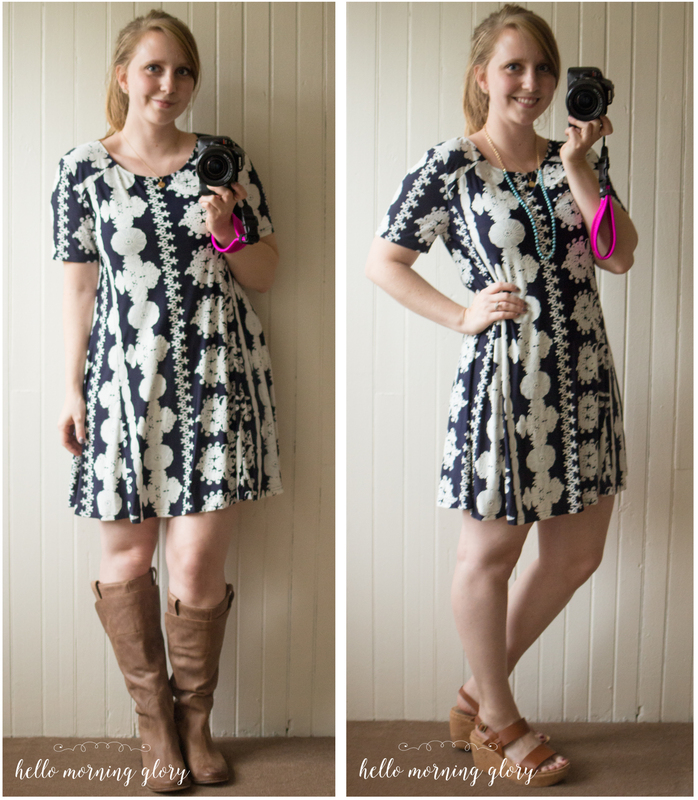 I just got the Pixley Connor dress in my fix! I love, love, LOVE the fit. I’m not too sure on the pattern. Thanks for sharing how you styled it! I might just be keeping it now! Thanks for stopping by! The fit of the Pixley Connor dress is definitely the first think I loved about it, the pattern took some time to love, but with it’s potential to mix and match with the rest of my wardrobe, it’s a total keeper! !